The extent and quality of native vegetation in the Central Tablelands has been greatly reduced through clearing, particularly on productive agricultural land. This project aimed to enhance areas of highly cleared ecosystems in the Watershed Landcare region by increasing the extent of paddock trees and clusters through engaging landholders to conduct on-ground works to improve linkages between remnant native vegetation on the land they mange. Paddock trees and other small patches of native vegetation play an important role in maintaining the productive capacity of agricultural land and are critically important to the conservation of native flora and fauna. The Paddock Trees project, supported by Central Tablelands Local Land Services through funding from the Australian Government, provided financial assistance to landholders to increase the extent of paddock trees and clusters on the land they manage by providing incentive funding to conduct on-ground works that improve vegetation extent and quality. Incentives were available to protect existing, remnant paddock trees, plant single paddock trees with guards and to install cluster and corner plantings, with individual landholders eligible to apply for up to $2,750 in funding and required to provide a 25% in-kind contribution (labour or materials) to the project. 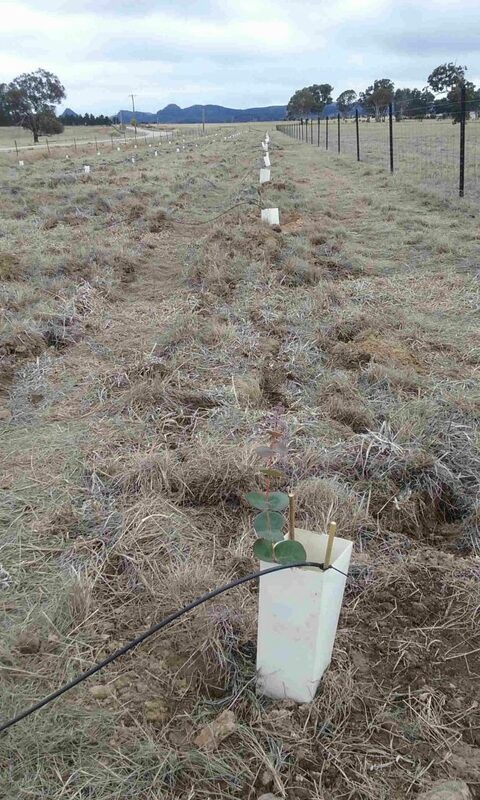 Six landholders from Lue, Rylstone, Gulgong, Stoney Creek and Mudgee participated in the project, conducting on-ground works to protect existing remnant vegetation and establish new corner, cluster and single paddock tree plantings. Participating landholders worked with Watershed Landcare’s botanist to select suitable, endemic species to meet their desired project outcomes. At one project site, the planting was designed specifically to aid with the remediation of a heavily eroded, saline area. As part of the project 8 ha were re-vegetated with over 1000 trees. When mature, these plantings will not only provide connectivity to existing remnant vegetation and improve native flora and fauna habitat value, but will also provide other valuable ecosystem services and improve landscape function and productivity of agricultural land. The removal of stock grazing and camp pressure will also encourage natural recruitment of native trees, shrubs and grasses in the project areas. A Paddock Trees and Farm Vegetation Management workshop was also held in April 2018 as part of the project. Watershed Landcare invited Dhyan Blore, Principal Consultant at Native Biota Rural Ecology, to share her extensive knowledge in rural vegetation management and the establishment and care of native plants. The workshop focused on providing landholders with knowledge and practical information to enable them to establish and mange their own native vegetation plantings, covering topics such as species selection for various sites and purposes, tree planting techniques, short term follow up and later management, including thinning and grazing.